Back to Basics Chiropractic understands that you want your items as soon as possible, that’s why we are committed to processing your order as soon as we receive it. Orders placed before 5pm Monday to Friday and before 11am Saturday will be processed that same day, subject to product availability. Should a product be out of stock you will be notified immediately and given an estimated time of arrival. Orders placed after 5pm Monday to Friday or on public holidays (NSW) will be processed the next working day, and orders place after 11am Saturday will be processed on the following Monday. All orders are sent via Australia Post and we will endeavour to provide tracking information where possible. 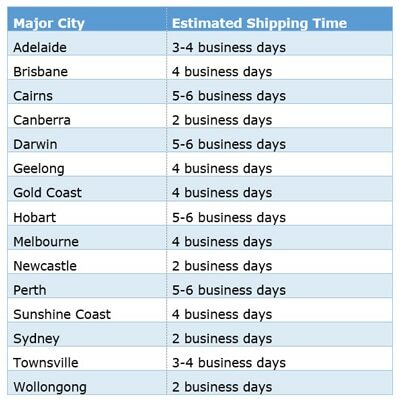 For your convenience please see the table below for average postage times to a selection of major Australian cities.